The Rocky Mountain Showdown they call it. It’s the first out-of-conference rivalry to arrive in the Pac-12 and it goes down tonight. It may not be the best game on tonight – that would be #7 Wisconsin visiting #5 North Carolina – but, as rivalries go, this should be a good one. This is a historically football driven rivalry but hate is hate and the two schools began competing in 1893, battling for the Centennial Cup. Getting back to hoops, CU has beat CSU more times than they’ve lost. The all-time round ball record between the two schools is 86-35, rather one-sided to date, but a rivalry nonetheless. In their last 10 meetings, CU has won seven of the games but they’ve been close. The average point differential over that period has been just 4.6 points, the average score being 79-75. These teams can score a little so it should be fun to watch them get up and down the floor. Last season, when CSU visited Boulder to take on the Buffs best team in some time, the Rams took the game to overtime on a last second layup before faltering, 90-83. The Buffaloes haven’t been great but they’ve played alright. Sitting at 4-2 they’ve been more competitive than their fellow preseason Pac-12 non-favorites, Utah. The Utes are a woeful 1-5 with their lone victory coming against San Diego Christian who I won’t bother to expand upon. But I’ve digressed. The Buffs run a deep lineup and, as coach Tad Boyle wants, they’re fluid and guard heavy. Arizona 83, New Mexico St 76: Arizona got off to yet another slow start despite some highly anticipated lineup changes. Kyryl Natyazkho was delegated to the bench in favor of Nick Johnson and a smaller starting group. But NMSU jumped to a 10-2 lead forcing a Miller timeout and no doubt a significant tongue lashing. Then it was time for Josiah Turner and Nick Johnson to show just how great they’re going to be. With the Wildcats down 56-58 with 10 minutes to play, Turner and Johnson scored or assisted Arizona’s next 16 points as the growing Wildcats pulled away. It was undoubtedly Turner’s best game as a Wildcat, going for 12 points, 6 rebounds, 3 assists and 3 steals. He did have 4 turnovers and fouled out, but it appears Turner is getting the hang of things. Johnson, however, stole the show with his sky high dunks and knack for hitting big shots. He scored 19 points in the Wildcat victory. There remain questions surrounding Arizona’s interior strength and inability to stop dribble penetration, but in this young season, wins are wins. Also, Solomon Hill continues to play terrific (12-6-7, one turnover). Oregon 64, UTEP 59: The big news here is that Dana Altman’s squad has lost its second freshman in as many weeks. Two weeks ago Jabari Bird left the program inexplicably. Then, last night, it was announced that Bruce Barron would leave the team as well. After the game, Altman made no bones about the fact that they were off the team, “I want guys who want to be here (and) I think everybody else is pretty solid.” With the proverbial door closed, the once fad pick for a big year find themselves slightly depleted and hurt. That said, these departures open doors for other players to excel and Jonathan Loyd did just that. The sophomore scored a career high 24 points and had this to say about it, “I love basketball, and getting more minutes means more fun. I just took the opportunity that I saw and it just happened to be me scoring.” He’ll need to continue to do so for the Ducks to remain competitive this season. The departures are also perplexing as Altman appears to get a lot of players minutes. Nine Ducks recorded 11 or more minutes Tuesday night. It will be interesting to see how this team – and program – moves forward. #23 Cal 73, McNeese St 57: The Bears struggled to start the game, needing a buzzer beating three from Allen Crabbe to take a 28-26 halftime lead, and Monty felt his team was “not mentally prepared to compete,” but after the break the Bears handled their business. Ultimately, this was a trap game for the Bears and they treated it as such early. Crabbe and Gutierrez combined to score 46 points and Justin Cobbs dished 7 assists as the Bears’ offensive core continued to click. This team’s bread and butter will be their defense (unless they’re playing Mizzou) and they’ll need Crabbe and Gutierrez taking the bulk of the shots. Crabbe is still easing into his role as the main scoring option and will likely struggle against more athletic defenders (again, Mizzou). He’ll need to prove he can score against quickness for this team to be taken seriously again. Colorado 70, Georgia 68: Yes! The Pac scored a win versus a BCS school. While Georgia may not be an SEC contender, they will play SEC schools and so kudos to you Colorado. Now, on to the important stuff, like Andre Roberson. He is really good. The sophomore went for 15 and 15 last night, his third double-double in five games. He’s beginning to get some national buzz which is great for the down conference. I’m intrigued that he’s getting being widely referenced as a guard. It may ultimately be his position courtesy some outlandish athleticism, but he would certainly appear to play a forward spot on this team. His skill set is still within the three point line but he’s demonstrated an improved shot in the early season. However you slice it, as his offensive game improves, so too will his draft stock. Stanford 79, Pacific 37: Is Stanford the best team in the Pac-12? Hey, I know UOP is awful and Stanford simply did what they were supposed to do against an inferior team, but they’re the only team playing like they expect to be good right now. Dawkins is handling his three point guards tremendously and has defined roles well. The Cardinal locked down last night and have been a model of consistency in this young season. They run nine-ish deep and, based on their OOC schedule, could head into Pac-12 play as a one-loss squad – only NC State and Butler appear to be challenging games before conference play. Keep an eye on Chasson Randle, he’s the equalizer on this team, and has played terrific to date. Josh Owens has simply been Josh Owens. UCLA 62, Pepperdine 39: Is UCLA back? No. The Waves are terrible – but beat a terrible-er ASU team in Tempe – but the Bruins finally notched a D-1 win. That’s a start. Beyond that, all the red flags previously raised on this team – attitude, offensive flow, effort – appear to remain and it doesn’t help that they had little to no fan support. Thirty-four (34, treinta y cuatro, 三十四) students came to the game last night. I know it’s far from campus and the Athletic Department appears to be falling apart and the team doesn’t seem to care much but, well, I guess things are pretty bad right now. That said, the Bruins did play improved defense which is the key to Howland’s teams’ success. The Bruins’ presumed strengths – malcontents Reeves Nelson and Josh Smith – played a combined 22 minutes, scoring 6 total points and grabbing 8 rebounds. While guard play is vital to this teams success, Lazeric Jones and Jerime Anderson can only max out at serviceable. If Nelson and Smith can’t figure it, the already long preseason will turn in to a miserably long season. The national polls dropped today and they include just one Pac-12 team, California. The Golden Bears come in at 24 and 23 in the AP and Coaches polls, respectively, while Arizona, Washington, and Stanford received votes in both. View the polls here. Now that you’ve seen the national rankings once again sparse of Pac-12 teams (or West coast teams for that matter as only Gonzaga, UNLV and Cal make the top-25 from over here) get used to it for another year. The conference has taken its early season opportunity to shake some of its negative stigmas and, instead, promptly wet the bed. There’s no need to go into the glaring defeats and non-existent quality victories, that’s been discussed ad nauseum. At this juncture, the Pac-12 has so few redeeming games on its collective schedule that this season will once again be devoid of top-25 teams in the conference. These are the impact games, ones that will draw a worthwhile national audience, that should boost the conferences wavering RPI and, perhaps more importantly, its appearance. At first glance, however, the only favorite would appear to be Stanford over the visiting Butler Bulldogs. After that, I see a lot of underdogs in Pac-12 clothing. So with little fanfare already in the polls and few opportunities to squeeze back in, the conference will likely have little to no top-25 representation as mediocrity beats on bad in conference play. Alas, it may be safe to assume that it will be another bad year for Pac-12 basketball. But let’s look bigger and abstract picture, briefly. Keep an eye on the football coaching carousel. With all of the recent firings in the Pac-12 you’ll begin to notice bigger spending as more TV money is soon to come (thank you Larry Scott). The press to improve football should trickle to basketball operations and demonstrate a need for everyone to catch up. Then, as programs (football and basketball and every other sport) get increased air time, the obstacle that is having a school in Pullman or Corvalis becomes a progressively smaller obstacle. Ultimately, the more attention one can garner, the better suited you are for success. At least that’s the way it would seem to be in modern college athletics. Things may not look so good but the aforementioned schedule is a good one. There’s some intriguing match-ups and good basketball to be played. If for nothing else, watch these games because, as a fan of the Pac, you know there’s still talent out here and you’re not going to read too far into upset losses and blowouts. Especially in November. Ultimately, up or down, good or bad, seasons are defined in March. Let’s withhold overwhelming judgement and see where this 2011-12 campaign takes us. Things appear a bit rocky inside the McKale Center. Following back-to-back losses, a seemingly imminent transfer, a public benching, lineup shuffling, and a fall from the top-25 rankings, such an assumption wouldn’t be too far off. With expectations high – as they should be – in Tucson, Sean Miller’s squad has not quite lived up to the hype six games deep. It’s been well documented that this team lacks significant size and depth in the front court, has no true point guard, is searching for a “go to” player, and is overtly youthful. These were concerns heading into the season and have been highlighted in the team’s performance thus far. In this brief sampling of 2011-12 Arizona Basketball, it would appear that this team may struggle. Lest of course we forget that this is Sean Miller’s third team. Or that this team relies heavily on underclassmen in critical roles. Or that, despite a run to the elite eight, Arizona had the same issues a year ago. This program’s curse has been its uncharacteristic success amidst turmoil. A “heavy weighs the crown” type situation where expectations swallow realism and patience is lost. It’s a situation where creative and free flowing high school and AAU stars are not forgiven a learning curve. Where reliable role players are expected to fill the shoes of lottery picks, and 6’8” power forwards must fill entire lanes. This is the reality of the 2011-12 Arizona Wildcats, a team that will learn in time and, above all else, compete. Because that’s what Sean Miller teams do. Nine months ago, I reminded Wildcat fans not to hit the panic button. Arizona had just been swept convincingly in Los Angeles and looked like a lost team late in their season. It was a less than encouraging time as the Wildcats had lost significant momentum in the Pac-10 race heading into the final weekend. Alas, we all know what happened next. The Wildcats went on to win the conference championship including seven of their final nine games en route to Anaheim and one open jumper from the final four. Don’t hit the panic button this year. Not yet, anyways. This team may not have championship talent, there may not be an All-American on the roster, let alone a center, but they’re going to learn, they’re going to improve, and they’re going to compete. Take Miller’s word for it, “The same five that started against San Diego State will never start another game (together) at Arizona.” There isn’t much reading between the lines in that quote: compete (AKA don’t dig a 15-2 hole to start a game) or find your way to the bench. This message will be heard loud and clear in the locker room and quickly manifested on the court. In summary, be patient because this group will get there. Tuesday was a dark day for the Twelve Pac. The lone, albeit muted, bright spot was a USC home victory over the winless Morgan State Bears. In this game, the mighty Trojans were down by as much as twelve before finally reclaiming the lead with two-minutes to play and hitting one more jumper before no one scored for the final minute. Exhilarating, no doubt, for the 2,200 in attendance. But beyond the barnburner Trojan victory, the Pac came out in full mediocre color last night. Before going into detail, let’s remind ourselves who was selected to win the conference this year: UCLA. Their preseason accolades were closely followed by the Cal Bears. The received 14 and 13 first place votes, respectively. That is to say, we expected little from USC, and much more from the bear teams. Last night they were both nationally beaten; losing by a combined 55 points, both dismantlings broadcast on the Worldwide Leader. It was like the opposite of a coming out party. By stretch of a comparison, the 1996 Bulls (Jordan’s 72-10 masterpiece) lost their ten games by a combined 77 points. And if you remove one 32-point loss to the Knicks, Jordan’s Bulls lost nine games by a total of 45 points. You can run the math but 45 < 55. That may seem irrelevant, but if you’re reading this then you’ve been watching ESPN’s broadcasts and you’re grossly familiar with the NBA2K commercial featuring MJ and Drake. I’m not going to link it because I’ve seen it too many times. Like every-ESPNU-commercial-break too many times. But back to the Pac-12’s mediocrity party. It hasn’t been a great November for the Conference of Champions. There are some marquee losses out there (Loyola Marymount, St. Louis, Pepperdine, Middle Tennessee State) and few marquee wins (St. Johns, Texas). But things will get better. They have to, right? It may yet be awhile, however. Arizona is coming up on the meat of its schedule with games against SDSU, Florida, and Gonzaga. The road gets no easier for UCLA as they play Michigan and Texas and could seemingly lose to anyone at anytime, anywhere. Cal has SDSU also scheduled and travels to Vegas for a December tilt with UNLV. Stanford heads to MSG soon for some big games and frankly, all games moving forward have the Pac-12 on irrelevancy watch. Oregon State has been a nice saving grace on the national scene. They’ve played well and are breeding a star in Jared Cunningham. But it’s still not a great sign when the best (not biggest but best) story in your conference is a team that still loses to Vanderbilt. If we want to point fingers for this mass of mediocrity, I point one squarely at Ben Howland and his UCLA program. Then I quickly point it at Lorenzo Romar at UW and then the Arizona Athletic Department. Success begets success and these three programs were the torchbearers of Pac-12 hoops. With Arizona’s dip into mediocrity and inability to handle their coaching transition, UCLA’s sudden and strange fall from grace, and Washington’s marginal success, the rest of the conference has been comfortable in mediocrity. The conference needs these schools in order to be good. It’s the same reason baseball needs the Yankees; not everybody can play Cinderella. That’s why it’s great news that Sean Miller has the top recruiting class in the nation with UCLA close on his heels and others garnering talented commitments. The current situation may seem bleak and dire, but it’s getting better. The Pac-12 can take its lumps now and it’d be nice to defeat another BCS conference team by more than a buzzer beater (this, anyone?). But it will come because success begets success. For the second time in a week, a prominent Pac-12 player has had team issues. In Westwood, it was Reeves Nelson amidst and adding to UCLA’s troubles. The enigmatic forward was suspended and reinstated in a matter of days (and one embarrassing loss) and promptly missed the team’s flight to Maui. The Nelson situation is beginning to be indicative of some larger issues in Ben Howland’s program, something we’ll learn far more about as the season develops. Such is not the case in Eugene, where Jabari Brown – a highly touted freshman – has abruptly left the Ducks. News of this broke Sunday afternoon and was later confirmed by a school spokesperson that the freshman indeed left the school, his future unknown. On the surface this would appear to be similar to UCLA’s goings-on: dynamic albeit mercurial player with a history of basketball success and attitude flags abruptly leaves the team. Brown’s prep career consisted of three high schools. He began at Salesian-Richmond before leaving to join Findlay Prep in Henderson, NV for his junior season. Then, mid-season at Findlay, Brown changed his mind and headed back home, enrolling in his third high school, Oakland High. That is to say, this ain’t Jabari Brown’s first departing rodeo. And while this is a blow to Oregon as a basketball team, I think it’s a sad indication of the poor leadership and mentorship surrounding the young man. This, by way of disclaimer, is a distant outsider’s observation for which I have no inside information by which to substantiate. That said, the entitlement and lack of commitment displayed by Brown and other prep stars is not a recipe for success. Luke Winn elaborately documented this earlier this summer with a phenomenal analysis of top-100 recruits, decommitting, transferring, and the like. Read it here. Winn put numbers to the anecdotal conversation, showing us that the average top-100 recruit in Brown’s class (2011) attended 1.69 high schools. The high school swapping led to an increased likelihood of deommitting and subsequently transferring. The increase in transfer odds? Nearly double the chances they stay put. What we learn from Winn’s study and Brown’s departure is that this is not an isolated event. It’s an unfortunate trend. One that doesn’t help students or athletes. So while the Ducks find themselves in a difficult albeit common situation, the concern should be focused on Brown. Where he goes from here and how he can grow and learn as a young man. His talent notwithstanding, he has some growing up to do. And in the mean time, all eyes will be on Ben Howland’s Bruins; breaths held with each faltered lead and missed bus. We all grow up someday. While Kevin Pangos was busy not missing anything, the Washington State Cougars discovered they have a dynamic big man. Brock Motum, the junior forward who averaged 7 points and 3 boards a year ago, was the motor and best player in maroon last night. 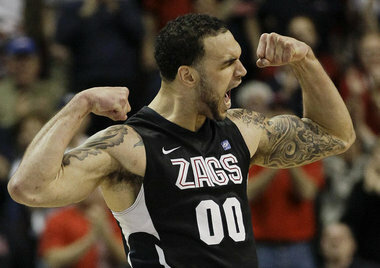 His energy helped to ignite a near 19-point-comeback in the second half of an excitable game in Gonzaga’s Dog Kennel. The 6’10” Aussie scored 17 points, grabbed 8 rebounds, and dished 4 assists against a ranked and bigger Gonzaga Bulldogs (take a peak at Robert Sacre vs. Brock Motum) and had energy for days. Many have presumed the Cougars would go as their back court of Reggie Moore and Faisal Aden went; basically leaving Cougar fans with little to look forward to. Moore was coming off a very disappointing sophomore season and Aden can simply be too inefficient with the basketball. If Monday night was any indication of what Ken Bone is going to get out of his starting front courtsman, don’t be surprised if the Cougars finish in the upper half of the conference. Of course for that to happen, Moore and Aden will have to continue to improve – if not impress – and the Cougars will need to overachieve on the whole. Motum’s motor can go a long way in seeing WSU do just that.